The Witty Ways of a Wayward Woman: I admit it! 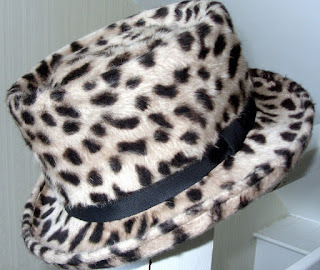 I have a fake fur leopard skin hat! "You have a leopard skin hat? I am not sure what is worse... the fact you have one, or the fact that you just admitted it! Either way, VERY disturbing." Look what's wrong with this hat? This is hat that belonged to my grandmother. It's real fur but unfortunately I can't remember which type. 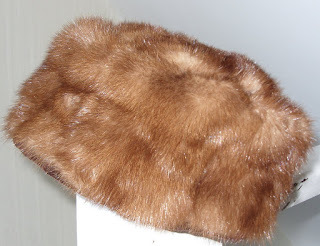 My grandmother probably made it herself or it was made by her best friend, Maud, who was also a furrier. My grandmother died aged 71 but Maud never married and went on to live till she was 100 and at one time taught at the London School of Fashion. I used to wear this hat a lot in my late teens and I still wear it when it's really cold; it has been cut on an angle which helps it to sit rather jauntily on one side which I rather like. This is my floppy summer hat I've worn for the last two summers. Well, actually I mean those odd couple of days when we've actually some sun....which was approximately 3 days in May last year. Oh well, never mind, if we had more than a week of sunshine I'd probably pass out from just the shock never mind the heat. Hmm..it's looking a bit weary though but somehow I don't think Mr T will believe me if I say we're expecting a heatwave and I need another. Pity. This my "investigative" hat. 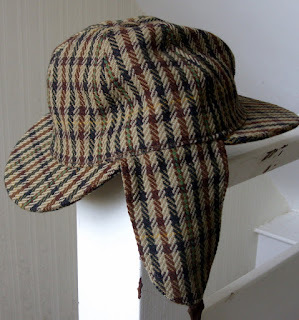 When I want to find out which one of the boys has left banana skins on the floor, not flushed the loo or left a red pen in their trouser pocket ( which naturally is always the time I forget to check before washing) I put this hat on ready for the interrogation. It works a treat every time although the tobacco stays in my lungs for days afterwards. I'm pretty sure this hat was made by grandmother for my mum although it could've been made by Maud but then it's the perfect fit so it could have been made for my grandmother....Oh well I can't check the details now... 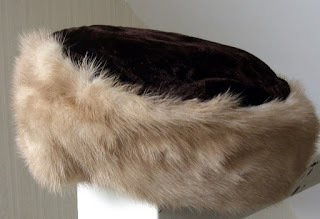 The fur is mink but before I get a host of complaints can we please remember it was made when to make and wear fur hats and coats was acceptable! This is a current favourite for wet days as it's got some sort of waterproofing which is great and I happen to think it's quite stylish! I prefer hats to hoods as I find hoods obscure my vision and with little boys one always needs to be prepared for the unexpected dash across the road. 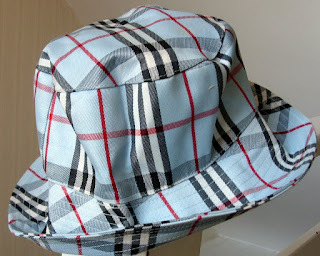 A hat, so long as you have the brim upturned, does the job perfectly! This is a recent summer hat belonging to my mum; I like it and I'm going to wear it; I'm not one for being ghoulish about things. This hat will always remind me of my mum and when I wear it I'll remember just what a great mother she was. Well there you go; a look inside the secret world of Mrs T, Housewife Extraordinaire. Ho, hum. Newsflash! 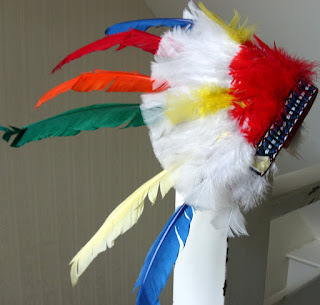 This is turning into a hat meme; Check out Paul Burman's site! Have you got some hats? Come and join in The Mad Hatter Meme! OK. So it was a gift. But you know, I once got given the gift of a bladder infection...but I gave it away! Well, OK, maybe not gave it away, but took some pills and killed the damn thing. But you...you have kept the hat. AND...I heard of a crazy cat woman just north of London with the exact same hat. Now then Jane...do YOU have any cats? Well? Yep, I've got three cats. Hats Hats everywhere. A different personality for each hat???? Ha! I'm speechless... but not wordless. Great hats, which make me think I might turn this into a meme and put together a hat post of my own. With all that fur, I'm pleased to offer you a rabbit to wear, but please could you come and catch it first. I would be delighted to wear a bunny on my head PB! Australia is a bit far to come though so maybe I should just take a shotgun out to the back garden? I could make it a cottage industry! Excellent PB! I look forward to seeing what strange contraptions you wear upon your head. I only hope they are not as strange as Aretha Franklin's contraption at Obama's inauguration from which I expected a rabbit to appear at any moment, or very possibly the hat to take-off and hover over the proceedings like Harold The Helicopter. Oddly with the sun melting our skulls we Indians don't have a culture of wearing hats. Terrible of us not to have borrowed this lovely tradition from the British though we've followed your footsteps in eating curry and downing Bombay Gin. I'm going to make a summer hat of my mum's old saris rightaway. God save my head. I wish you every success in manufacturing a hat out of your munm's old saris! I hope you have more success than I had manufacturing one of my husband's old underpants. Frankly,it was a bit of a disaster but it did tone nicely with my brown boots. Do you do ANY work???? Golf, gambling, racing, boozing...Are you sure you're not pretending to be Gary Davison, author, and in reality you're actually John Prescott?? Yeah, okay. I admit it. Definately a loose cannon. Well, that's what they told me when I checked out. I'm off out to buy a hat, to hell with it! Excellent, excellent Gary, in between signing books and showcasing your mother (he,he,he) you can nip into M&S and pick up a selection of hats! Work is quiet eh? What you need to do when your pitching for your contracts...is...wear a hat!! That way everyone will remember you and no doubt be impressed - a guy can wear a little pink hat has got balls!! Ps...Don't think I haven't seen that car photo ..I'm coming over to give you some vitrolic abuse!! Love all your hats Mrs T. The first one's so 'Audrey Hepburn' to me. 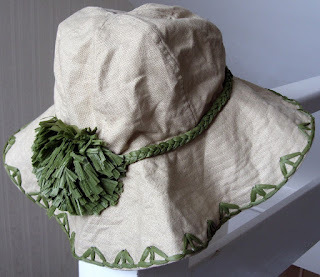 Your mum's summer hat is pretty. But the best is the Liz Clairborne cap from your earlier post. 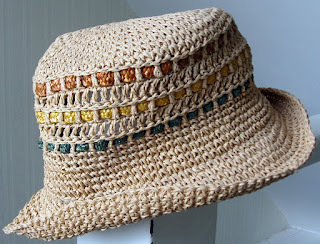 I agree, that little brown number has leaped into pole postion as my favorite hat! I'm going to be wearing it for a few years more... although it won't stop me from looking at some more! Guess what, I had this mental image of all English ladies always in hats. You know that is the kind of pictures we saw in our text books as children - English men and women were always wearing hats. I guess they needed it all the time when they were in this country with its long and unbearable summers. So it was a bit of a disappointment when I hardly spotted anyone wearing a hat on my few trips to England. And I love your hat collection. Of course your Queen always wears one and her ex Daughter-in-law did too - didn't she? Well all the royal ladies where hats; it's the proper thing to do! But I think for quite a while it was a dying trend; the only hats around would be on little old ladies at Sunday mass or at weddings. But I think they're making a comeback - like watches they are now seen as more of a fashion accessory rather than as purely an item of necessity. That said, I've always done my own thing, cos I'm bonkers. Also for most of my life I had short hair and I've found hats just don't sit so well on long hair...maybe that's why many women don't wear them anymore?